Tex-Mex Poblano Artichoke Dip puts a fun, Texas spin on a classic holiday favorite! Poblano peppers, simple Tex- Mex spices, and a spicy cheese blend transform the classic artichoke dip into a spicy, sassy, show stopper! Hi! This is Emile again from Tales of a Texas Granola Girl. I don’t know about your family, but typically the spread at any family get together around here, especially during the holiday season, starts with a ton of appetizers and snacks. Honestly, it’s always been my favorite part of dinner! It’s grazing at its best! As a kid, I was pretty much guaranteed to be found hanging around, not the dessert table, but the table with the yummy homemade dips! One of the appetizers that always seem to make the holiday table in our family was a classic baked artichoke dip. When I was a kid, it was the thing I looked forward to most at family gatherings…if it was on the table, I was camped out by it! As I’ve gotten older, the same old artichoke dip still shows up on the table…still yummy…but predictable. You know how it goes…we all have that one Aunt or Grandma that brings the same dip or dish every year because it’s always been a hit! Whenever I host a holiday party or I’m asked to bring something, I always try something new…it keeps everyone on their toes and keeps the holiday menu interesting! Enter Tex-Mex Poblano Artichoke Dip. As much as the classic will always hold a place in my heart, I thought it would be fun to put a fun, Texas spin on the beloved artichoke dip recipe, and hold onto your boots…cause it’s AMAZING! 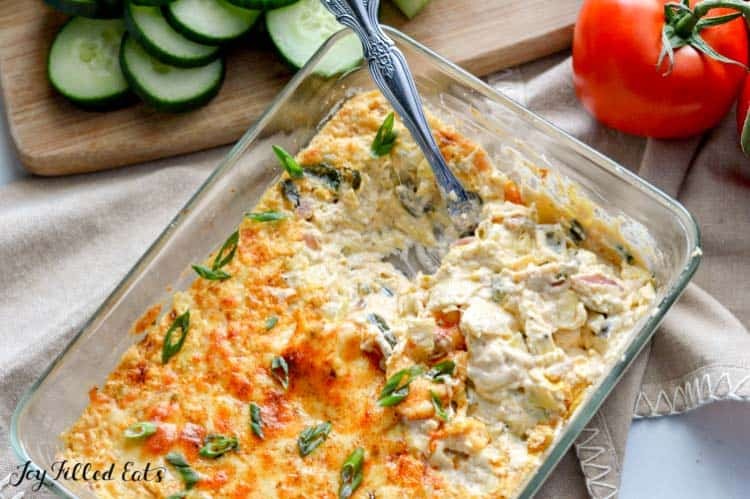 The addition of poblano peppers, onions and warm, Tex-Mex spices like cumin and paprika and melty Monterrey and Pepper Jack cheeses takes this dip to a whole new dimension! Spicy, creamy, rich, decadent and packed full of great Tex-Mex flavor! 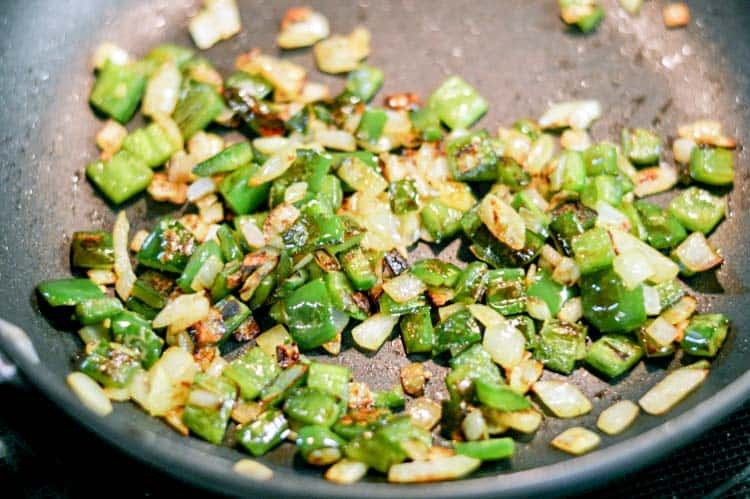 One of the secrets to this recipe is to brown the onions and peppers! It gives the dip great flavor! 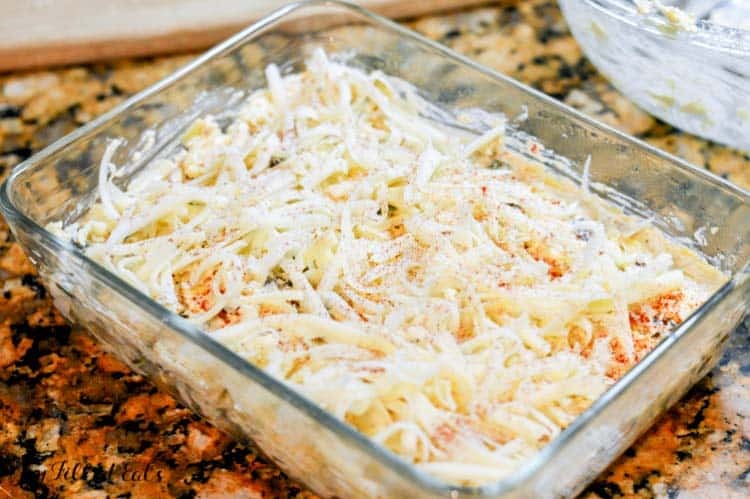 Great for a holiday dinner party or even game day, this artichoke dip can be quickly assembled in advance and refrigerated until it’s ready to go into the oven. Cheese all grated up and ready to go into the mix! 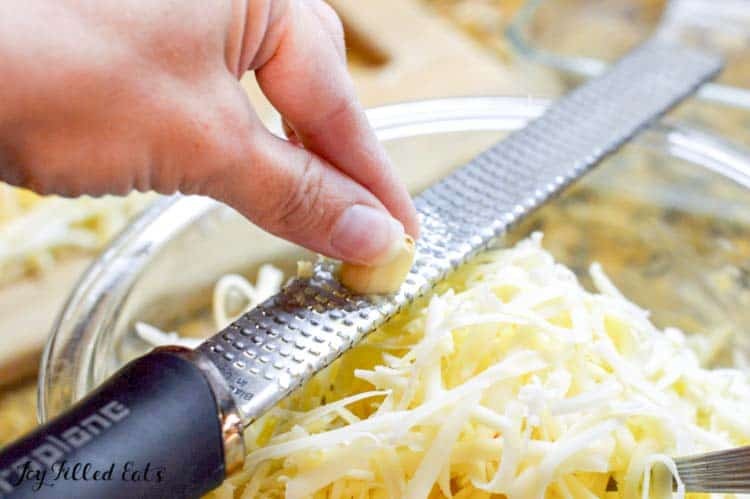 Just a tip…a Microplane grater makes quick work of a garlic clove…no chopping needed! It’s probably one of my most used kitchen tools! Ready for the oven! Bake 20-25 minutes at 350 degrees! 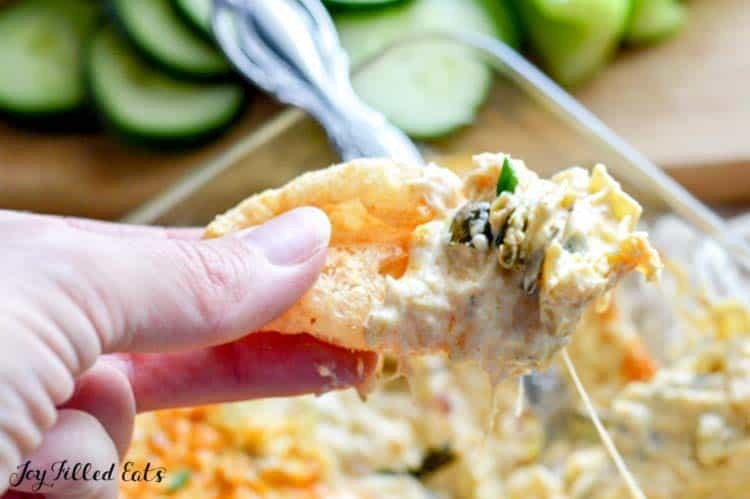 Served with pork rinds (my favorite), crispy celery sticks, cool cucumber slices, colorful bell pepper chips or even Fat Head crackers, this Poblano Artichoke dip will be the hit of your holiday party! Gluten free, low carb and keto friendly! Have dip leftover at the end of the night? Serve it over Cilantro Lime Chicken and cauliflower rice for a quick weeknight meal! 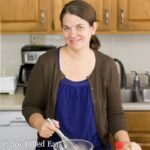 For other gluten free, low carb and keto dishes, check me out at Tales of a Texas Granola Girl! Looking for other yummy, gluten free, low carb/keto dishes to serve up on game day or for the holidays? Check these out! 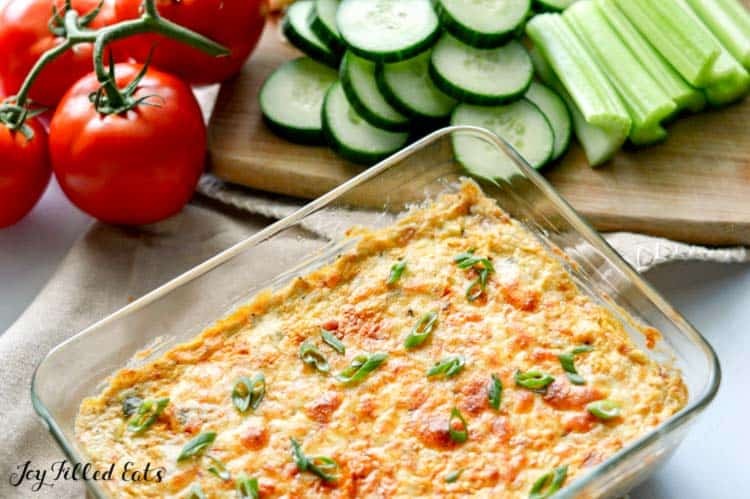 Great for a holiday dinner party or even game day, this yummy dip can be quickly assembled in advance and refrigerated until it's ready to go into the oven. Served with pork rinds, crispy celery sticks, cool cucumber slices, colorful bell pepper chips or even Fat Head crackers! Gluten free, low carb and keto friendly! Preheat oven to 350 degrees. 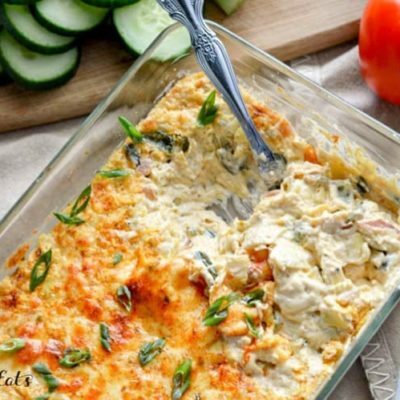 Grease or spray a 6 cup casserole dish. In a medium skillet over medium-high heat, melt butter. Add onions and diced peppers to the butter and saute for 5-7 minutes or until they start to brown. Once onions are translucent and slightly browned, remove from heat and set aside to cool. In a medium mixing bowl, combine chopped artichokes, cream cheese, mayo, garlic and seasonings, and mix. 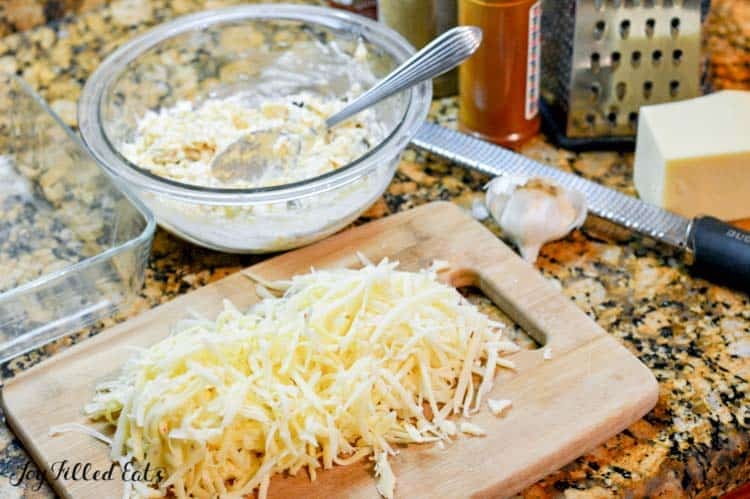 Then add the pepper and onion mixture and both kinds of cheese (reserve 1/4 cup of shredded Monterrey Jack for the top). Stir mixture until completely combined. Pour mixture in the prepared casserole dish and spread evenly. Top with remaining cheese and bake at 350 degrees for 20-25 minutes or until bubbly and golden brown. Serve warm with pork rinds, veggies or low carb crackers! Any thoughts on doing this in a crock pot/slow cooker? I've actually never made a dip in a slow cooker but I'm sure this one would be fine. So would a 13x9 pan work? You would have to double it. A 6 cup casserole is closer to an 8x8. Would you cook it for as long though or more time ? If you double it I'd add 5 minutes to the cooking time. Maybe 10. Just check the center gets hot. I've never made artichoke dip with poblano peppers before! This looks so delicious. Cannot wait to make this the next time we have folks over for football! Thank you so much for sharing.